Chance is keeping his promise to boost Amara Enyia’s profile across Chicago. West, who donated $73k to Enyia on Monday, was not billed to appear at the rally. 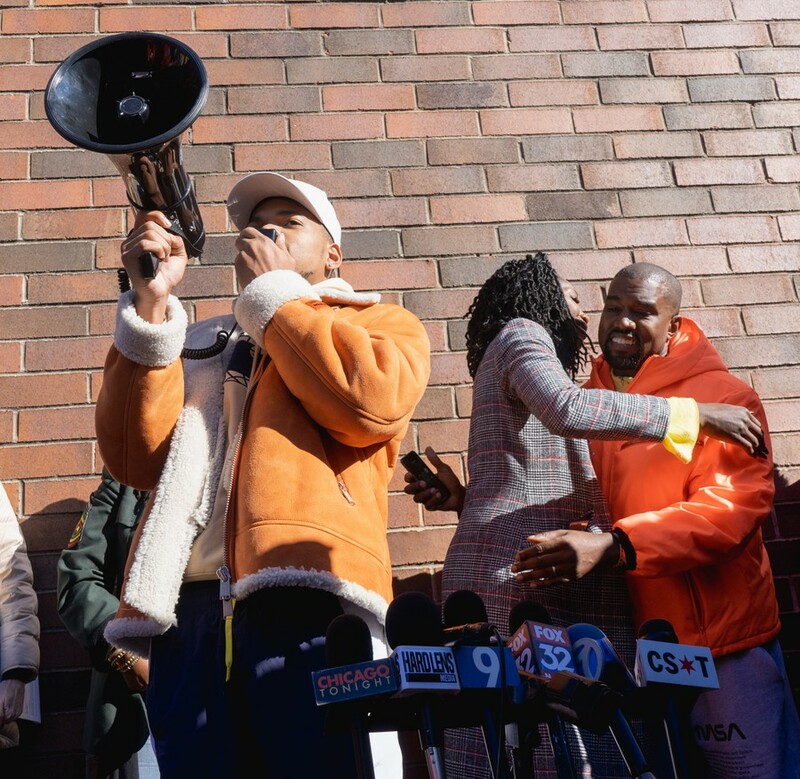 Kanye West quietly slipped into a rally hosted by mayoral candidate Amara Enyia and Chance the Rapper at 63rd Street and Cottage Grove Avenue on Tuesday afternoon. The rally, which drew a crowd of over 200 people, comes a day after West donated $73,540 to Enyia’s campaign, and a week after Chance endorsed Enyia at a press conference at city hall. Throughout the rally, which was billed as featuring only Chance and Enyia, Enyia repeatedly said that she wanted to hear Woodlawn residents discuss their concerns in the neighborhood. However, shouts in response to West’s sudden appearance and calls for Chance’s attention repeatedly drowned out community members’ questions and Enyia’s responses. See here for video coverage of the event. Enyia, 35, is the director of the Austin Chamber of Commerce in the West Side of Chicago. She ran for mayor in 2015, but dropped out before the vote. Long seen as a longshot to become mayor next year in a field of what now totals 17 candidates, Enyia received an overwhelming amount of attention after Chance’s endorsement last week. At the highly anticipated press conference, Eniya said that Chance’s endorsement “is not your typical flash-in-the-pan endorsement,” explaining that Chance would be supporting her throughout the campaign rather than support her in just a one-time announcement. The rally drew a crowd of over 200 people. At the rally, Chance was the first to take the speakerphone, but quickly passed it on, saying, “I’m going to let our future mayor, Amara Enyia, speak to you guys.” He then stood behind Enyia as she explained the purpose of the pop-up rally. She then voiced her support for a Community Benefits Agreement (CBA) to protect Woodlawn residents from displacement due to the incoming Obama Presidential Center. Chance has also long supported a CBA. A few minutes in, attendees began noticing West, who inconspicuously appeared on the back wall behind Enyia and Chance in a neon orange jacket. West did not speak, but Enyia acknowledged him briefly. “I also have to give kudos to Ye,” she said. She then hugged West, and he left shortly after. Enyia's assocation with West, an ardent supporter of President Donald Trump, could land her in hot water among a strongly progressive constituent base. Enyia told the Chicago Sun-Times on Tuesday that she is not a Trump supporter and does not have to answer for West's stance toward Trump. Chance and Enyia then began taking questions from attendees, which touched on violence to policies on immigrants. However, as the attendees continued to swarm closer to Enyia and Chance, their answers became harder to hear for members in the crowd, which had begun spilling into the road. 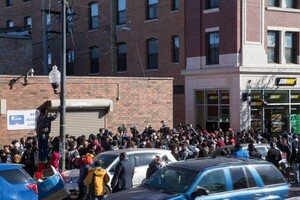 Many attendees were Woodlawn, Hyde Park, and Englewood residents. UChicago and some Northwestern students made up a large part of the crowd as well. Enyia ended the rally by saying that she would continue to make pop-up appearances throughout the city in the next few weeks. She said her next rally will be this Saturday downtown, and that she will announce details on Twitter. The article was updated to reflect the fact that Enyia told the Chicago Sun-Times on Tuesday that she is not a Trump supporter and does not have to answer to Kanye West's support for Trump. The article previously said that Enyia had not yet commented on West's support for Trump. The rally will be on Tuesday 1:30 p.m. in front of Cobb Hall.